It was as I was riding down 13th St in Park Slope, not far from my apartment, last Sunday that I heard the sound of honking behind me. 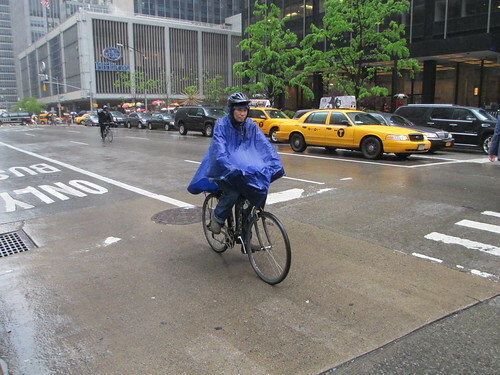 Looking over my shoulder, I saw a black Lincoln Town Car – vehicle of choice for many New York City car services – barrelling down the street towards me and my son, who was on his trailer bike behind me. But my response wasn’t what the driver obviously hoped it would be. Knowing that the street’s single lane, though wide, lacked the space for a wide vehicle to pass safely at speed, I steered into the very centre of the lane, preventing his attempted pass. At the next traffic light, he pulled up next to us and yelled how I should have been over to one side of the street. He then gave a loud blast on his horn and passed aggressively and fast. At the light after that, I asked his passenger please to withhold her tip. The driver was inconsiderate and dangerous, as I pointed out in my subsequent complaint to the Taxi & Limousine Commission (top tip, for-hire drivers: behave especially well if you’ve got an easily-remembered licence plate). But he also misunderstood the complicated relationship between space and speed. 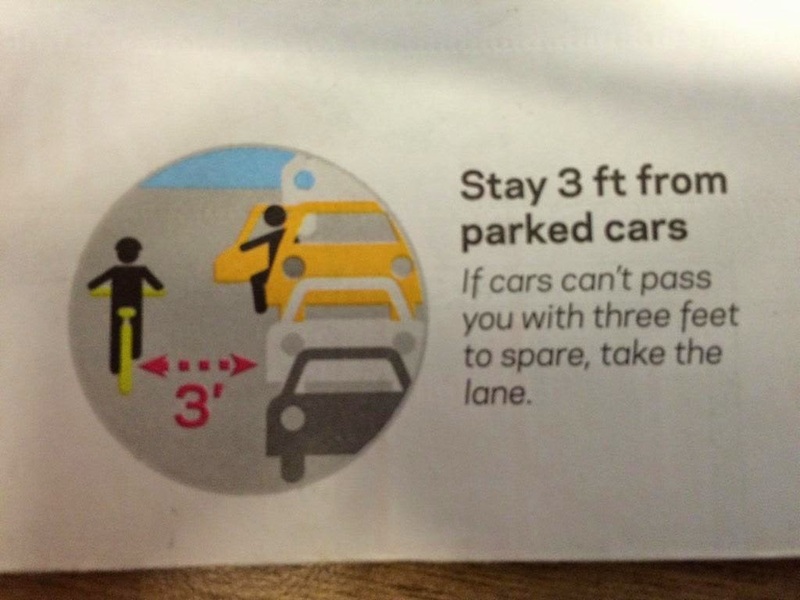 There are circumstances where it might be safe for a 6’ 6” wide car to pass a bicycle on a 28’ wide street where parked cars are taking up 8’ on either side. But they don’t include occasions when a person is riding a bicycle laden with groceries and hauling a trailerbike at 17mph downhill. It’s at the root of very many of my arguments with motorists that few seem to understand how I expand the buffer zone I’m mentally defending around myself as my own and other road users’ speed increases. I’m sure that many motorists see me and other cyclists squeezing past stationary cars and jump to the wrong conclusions. It’s a very different business riding close to a stationary motor vehicle and next to one doing 40mph while one’s riding at 20mph. Fast-moving vehicles travel far farther while the driver is processing the need to stop and then need a far greater distance to come to a halt. It should be obvious that every mile per hour of extra speed disproportionately expands the invisible balloon of space I need to keep free. The point is especially important because so many of the disputes about how to accommodate growing levels of cycling use – or cities’ aspiration to have more journeys by bike – come down to the allocation of road space. The debate is an asymmetric one at present. Nearly anyone who regularly rides a bike in a city will have thought about the space he or she can use on the roads, how the space is apportioned and the issues that that allocation raises. Many people who drive cars around cities seem instinctively to think the roads should be freer of obstructions in front of their cars, wider and more conducive to high speeds. 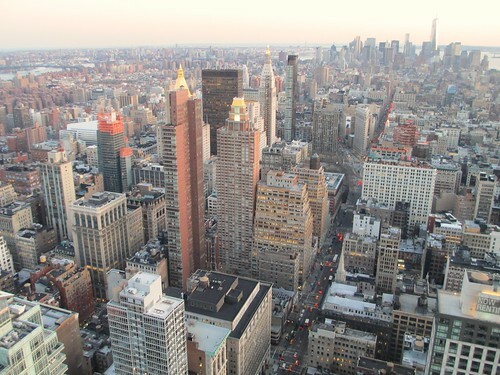 To such a view, any space taken away from cars is being stolen from its rightful owners. The whole issue has reminded me of a reporting visit I undertook 10 years ago to Line 14 of the Paris metro, the city’s first entirely driverless metro line. I noticed how trains slowed down from their 80kph (50mph) top speed well in advance of the terminal station if another train was occupying the platform. But then, as the trains slowly negotiated the junctions at the end of the line before turning back, they would come almost in touching distance of each other. They were under the control of one of the world’s most advanced signalling systems. It was constantly calculating the balloon of space it needed to maintain between trains, providing many train lengths’ of empty space in front of each train at top speed but barely any at 10kph (6mph). a corridor of collision uncertainty. A chaotic, busy street makes far more sense if one pictures every object encased in balloons of space like those that Line 14’s signalling system projects in front of trains. 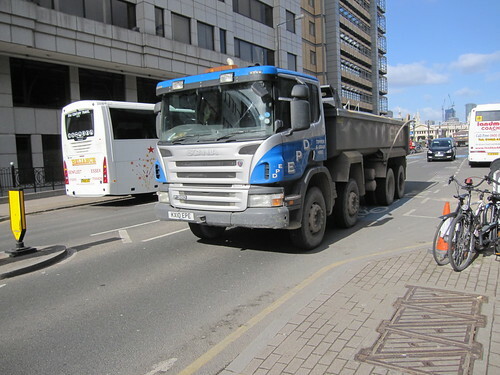 Every vehicle operator should be maintaining in front of him or her enough empty space to stop safely in the event that an unexpected danger crops up. But, just as importantly, everyone on the street needs to plot the trajectories of other vehicles or other potential obstructions. Looked at this way, it’s clear why suddenly-opened car doors pose such a danger. No other obstruction can appear as suddenly or with as little warning as a suddenly-opened car door. I refused to let the angry car service driver past to avoid being forced into the door-opening danger zone. 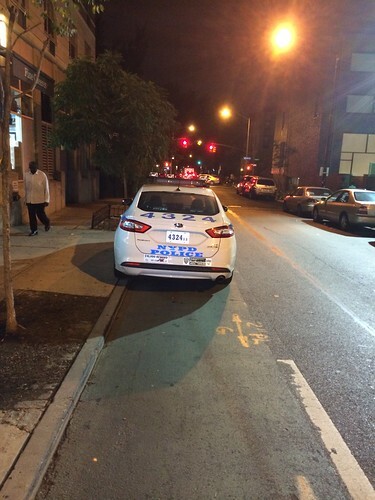 To the driver, I’m sure that looked like a willful refusal to go into an unused, empty zone. It’s because I draw a safety balloon round any moving vehicle that I find myself at least once a week in shouted conversation with the drivers of vehicles that have started pulling into my path. “Stop!” I’ll shout as the vehicle keeps moving across my path. “I see you!” the motorist shouts, exasperatedly, as if I should implicitly trust that the driver of a slow-moving vehicle on a collision course with me will not immediately turn into a faster-moving one. navigational equipment, if not her limited maneouvrability. 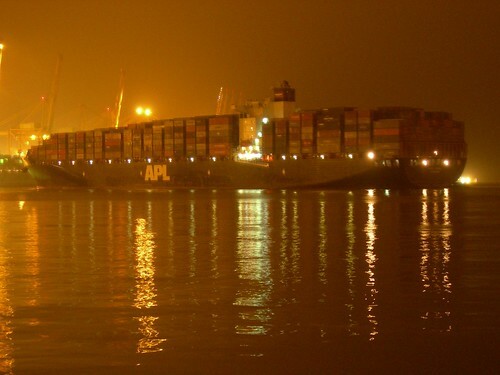 I yearn for something like the collision-avoidance radar I watched a pilot use seven years ago as the APL Pearl, a container ship on which I was travelling, negotiated the chaotic shipping lanes of the English Channel. Each vessel’s radar plot had in front of it a line showing where it would be within six minutes. Slow-moving oil tankers and bulk carriers sported only relatively small, short lines. The lines before container ships like our own were longer. However, a fast ferry emerging from the Port of Boulogne suddenly threw a long, worrying line across the paths of many of the vessels, including our own, sending the pilot into a brief frenzy of calculation about collision courses. The more one ponders the complexity of the interactions on a shared-use street – or the English Channel - the less one becomes surprised at people’s tendency to crash into each other. The surprise is how effectively most of the time people manage to miss each other. Yet a trip the week before my run-in with the Impatient Car Service Driver of 13th Street suggested a different lesson about space. 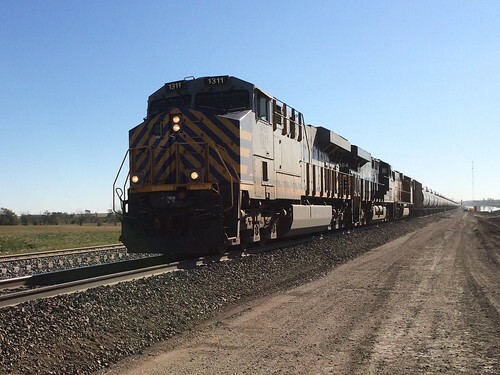 I was visiting the Burlington Northern Santa Fe railroad in North Dakota, where sudden, unexpected growth in both agricultural and oil traffic has led to significant congestion. As we drove by the company’s main line across the region, we saw an Amtrak passenger train zipping along the main line at 70mph, far faster than the 50 or 60mph common for freight trains on the route. “I’ll bet that really eats up capacity,” I said to the railroad people, to a resigned harrumph of acknowledgement. No railwayman relishes running trains of sharply-varying speed next to each other. The fast ones constantly catch up with the slower trains in front, leaving unused space behind them. The slow ones constantly fall behind, leaving unused space in front of them. It's key to improving road safety to control vehicles' speeds on city streets and New York in particular needs to do a far better job of the task. But there is also, it occurs to me, an Amtrak-type effect on many congested streets where bikes, cars, buses and others share space. The differing braking and acceleration statistics of the different vehicles waste space and capacity as effectively as if the New York subway decided to run the F Train with a mixture of the latest electric subway trains and its plodding diesel maintenance trains. 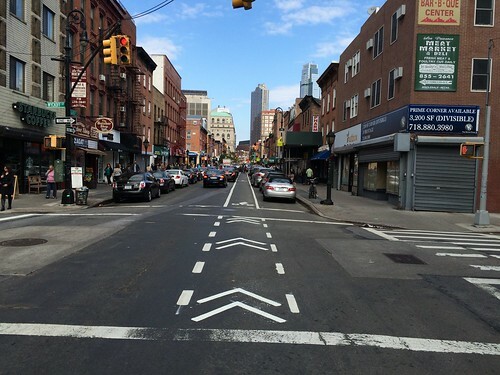 Were New York’s Department of Transportation to provide properly-segregated bicycle lanes on downtown Brooklyn’s most chaotic streets, it’s easy to imagine that they would instantly become far more efficient places, as well as far safer ones. It’s perhaps time to label such streets as optimised streets, rather than simply safe ones. It will, of course, be some time before all the hundreds of backstreets like the one where I was riding last Sunday will justify such optimisation. While the ultimate cure for episodes like the one I encountered might be surgery for the street, the short-term response will still be for the driver to take a don’t-be-an-inconsiderate-fool pill. But the spaces under the streets of many cities and the rail lines that march across many countries’ open spaces show that transport can be conducted in an orderly, safe, efficient manner. It would be a tragedy not to learn at least a little more from them. Update: I've just heard (on February 25, 2015) that the limo driver who harassed us has been dealt with - with a $200 fine an no points on his licence. I'm glad he's faced some penalty. But this strikes me as fairly paltry - and heightens my concerns about Taxi and Limousine Commission procedures. The details of the time I was knocked off my bike in March 2009 remain vivid in my mind. The light telling me it was safe to ride across Newington Causeway, near Elephant & Castle, South London, was in my favour but had started flashing, to warn me it would soon turn red. Being in a hurry and wanting not to lose momentum, I pedalled out fast across the busy, four-lane road. Elephant & Castle, where another cyclist hit me. than the fellow-cyclist that hit me. Then, as I reached the middle of the road, a rider on a fixed-wheel bike came zipping past the line of stopped traffic, through the red light and hard into my right-hand side. When I’d got up, out of the road, yelled at him and told him I was calling the police, he made off. Yet, while the facts are straightforward, I’ve had multiple discussions since on how to interpret them. Several people have told me the experience ought to make me acutely aware of the potential for rule-breaking and negligent cyclists to cause serious injury to others. Some people become highly agitated that I don’t accept such an apparently simple explanation. It irritates some people still more that my interpretation of the incident goes against the grain of my direct experience. I believe it demonstrates how relatively safe bicycles are for other road users, even when ridden recklessly. I was just recovering when I was struck on Newington Causeway from being knocked off 32 days before by a negligent motorist. The collision with the reckless cyclist hurt a lot less. What happened to me was also fairly unusual. In many years in the UK, cyclist/pedestrian crashes kill no-one – they are certainly a far lower share of pedestrian fatalities than cyclists’ share of traffic. Despite two recent horrible tragic deaths after cyclist/pedestrian collisions in Central Park, fatalities in cyclist/pedestrian collisions are just as rare in New York. The last such death before the two recent ones was in 2009. I’ve never heard of a death from a crash between two cyclists. I stick to a more complicated interpretation because I’m convinced it seldom makes sense to understand the world purely on the basis of our own personal experience. It’s vital to overlay things one sees and hears with information about their wider context. Careful, direct observation is certainly a useful way of enhancing our understanding of the world – but it’s a far from complete one. Most importantly, I’ve come to realise that people’s reluctance to think rationally about events they’ve witnessed on the streets is a significant barrier to improving safety. Serious crashes are so rare that anyone basing their ideas about road safety purely on their own observations is all but doomed to come up with a faulty understanding. The phenomenon is at least in part responsible for the terrifying taxi ride I had on Monday from my apartment to John F Kennedy Airport. As we hurtled at 70mph down the Brooklyn Queens Expressway inches from other vehicles and the road’s concrete barriers, I begged the driver please to slow down. It was clear to me from a rational understanding of the risks of the driver’s speed, his limited room to correct if something went wrong and knowledge of patterns of New York road crashes that his behaviour was objectively highly dangerous. Yet the driver, who had presumably never crashed his vehicle at speed into the expressway’s barriers, saw my complaint as an expression of purely subjective taste. The root of such misunderstandings lies deep in unspoken assumptions about how best to interpret the world. Many internet commenters and others reflect without knowing it the ultimate triumph of Romanticism. Just as Romantic poets like William Wordsworth thought emotion and experience the critical means of interpreting the wider world, there’s a strong, implicit assumption that one’s own subjective experience and one’s feelings about it are the only reliable anchor for the ship of perception in the stormy, uncharted ocean of reality. until you apply reason to it. 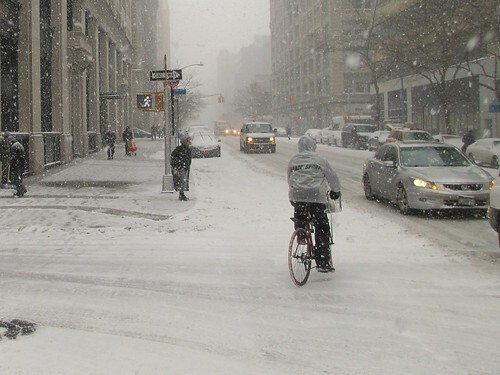 It was because of this assumption that I found myself lambasted this week in a debate on the New York Cycling Club’s Facebook page about food delivery cyclists. Didn’t people agree, one member of the club had asked, that food delivery cyclists needed to be properly regulated and banned if they didn’t improve their behaviour? The conversation grew more and more heated. I pointed out, firstly, that food delivery cyclists are already absurdly heavily regulated given the limited damage they cause. I added that, since a collision with a food delivery cyclist last killed someone in 2009, they’re not as dangerous as they might seem. I suggested, lastly, that it’s hardly surprising such a put-upon group – the delivery riders are nearly all very poor, newly-arrived migrants – often feel too rushed to follow all the road traffic laws. The original poster’s furious response was to write that she’d had to dodge six food delivery cyclists on her ride home that evening. She so resented my effort to overlay an alternative interpretation that she started questioning whether I really knew what was going on on the streets. Was I even a cyclist? How many miles a year did I ride? It’s not the first time I’ve been asked to provide an annual mileage as part of such a dispute (4,000, since you’re asking). I eventually took the coward’s path of leaving the club’s Facebook group to escape the bombardment. use: 43,782 miles of evidence for doubters. I find reason – the style of thinking in vogue just before Romanticism – far more useful than Romanticism in interpreting the world. I’m far more likely, it seems to me, to understand the world well if I seek to fit my personal experiences into a broader framework of statistics, news reports and other information. It’s because I try to view the world through such a coherent prism that I seldom complain about the frequently irritating – but ultimately not seriously dangerous – behaviour of pedestrians who obstruct me on my bike. It’s because I can see from statistics that cars are much my biggest danger that I far more regularly dwell on the risks they pose to my safety. Nearly everyone who moans in newspaper comment pieces about the dangers posed by reckless cyclists is doing so on a Romantic-Wordsworthian basis. His or her experience of encountering cyclists – their fear at having a rider pass close by or alarm at riders’ speed – is a reliable guide to how the world works. A speeding cyclist dodging among pedestrians in a crosswalk looks to the naked eye more dangerous than the surrounding, halted cars. Looked at rationally - including the vast amount of statistical evidence - the scene looks very different. It's clear the cars pose a far greater danger. Reason, of course, is no policy-making vending machine. One doesn’t put in a set of factors and collect a solution from a slot at the bottom. It makes sense only in helping one to understand how to achieve a set of goals. harassment, according to one person with whom I argued. If, for example, one thought that the most important thing on the streets was to impose a sense of order and fear of breaking the law, possibly a further crackdown on food delivery cyclists might make sense. I look at the issue within a wider framework of thinking police action must be proportionate to the scale of the problem involved, that it’s better to have goods carried around on bikes than in more dangerous cars and that it’s important to feel compassion for society’s least powerful people. Reason is the tool to help one to understand how best to achieve one’s objectives, not to set the objectives. Yet “rational thinking, based on the fullest possible information” is a poor slogan to paint on a battle standard. “Your personal observations are deluding you” is likely to sound like an argument for a conspiracy theory. I’d consequently argue not just for pure reason but for the outcomes it can produce. In many western countries – but especially the United States – the current, Romantic means of making decisions is producing essentially conservative outcomes. People don’t like the way they see cyclists riding their bikes so argue against providing better facilities for them. People see drivers parking their cars and going into shops, so conclude the shops will die if some parking spaces move. People see traffic jams on streets that are broad and conclude the jams will only get worse if the streets are narrowed to make bike paths or wider sidewalks. A more thoughtful approach can make powerful arguments for changing things. A reasoned argument can point to the substantial evidence that increased cycling can cut the US’s 33,000 annual road deaths or the far smaller annual total in the UK. Reason can point out that, while cyclists’ road deaths are visible, the risks of not cycling – and of dying from diabetes, heart disease or an inactivity-related cancer – are far higher. 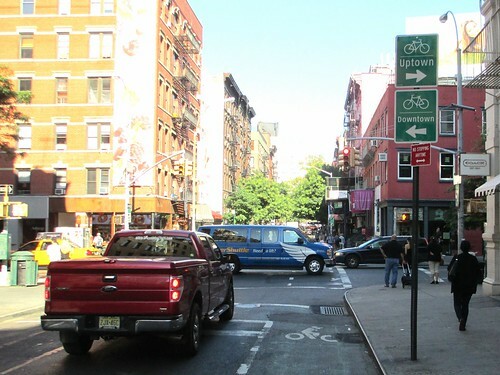 Logic can show that traffic often flows better in narrower streets than wide ones. Action based on those logical principles must ultimately encourage more people to get about by bike, reduce road deaths and reduce pollution and carbon emissions. That should mean that thousands more people daily can experience the liberating feeling of powering themselves to work or school in the open air, rather than inside a car or down in a subway tunnel. Far more people will hear the sounds of birds chirping even in city trees, will spot the strange effects of light at night and experience the change of seasons as one does on a bicycle. Far more people will experience each morning the excitement of riding onto the Brooklyn Bridge and seeing Manhattan spread before them in the sunlight. Those are all, reason tells me, positive changes, ones for which sound, logical arguments can be made. But they will provide plenty of moments to warm the heart of a Romantic too.